What is a visit to NYC without great food and drinks?! We decided to venture out to the flatiron district and have lunch at a place that came highly recommended. When you walk into Eataly, it is like a large Italian market with all sorts of neat things to browse through and purchase. There are also food station areas to order pastas, vegetables, and seafood. But, the best part is that they also have a rooftop area with nice views of the city while you enjoy yummy food and beer they brew themselves. 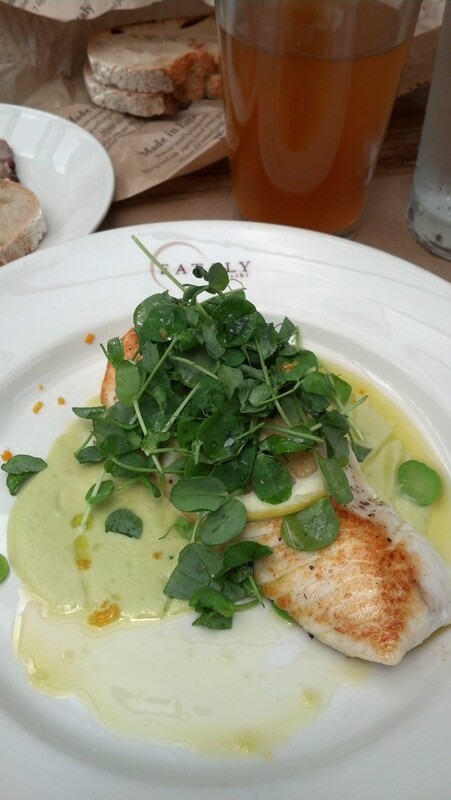 I went for their wheat beer and grilled halibut dish. Amazing! 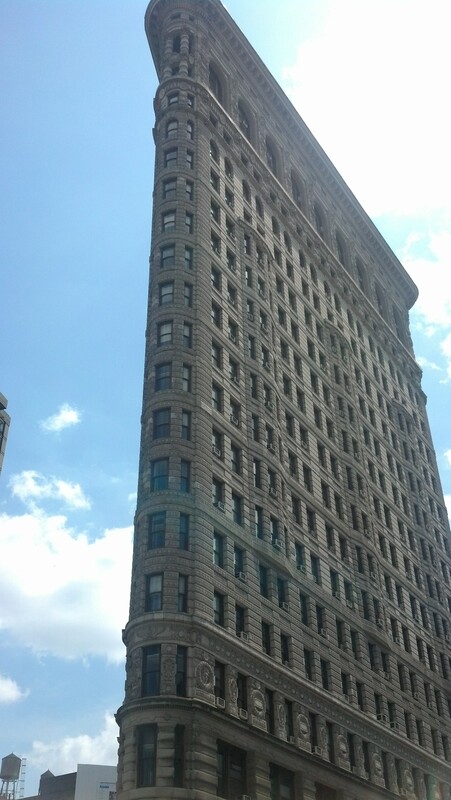 Those familiar with the flatiron district will recognize this signature building. 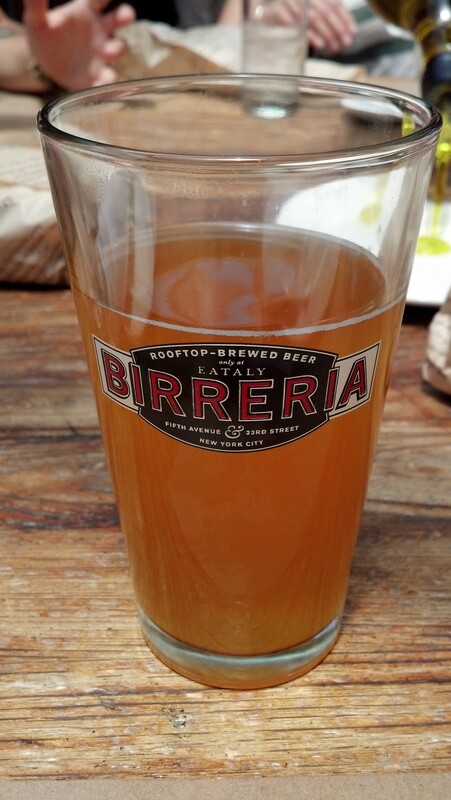 After a delicious meal with friends, we wanted to take advantage of the beautiful weather and have a few drinks at a beer garden. Because the city is so packed and condensed, it is hard to find a truly open and spread out beer garden. 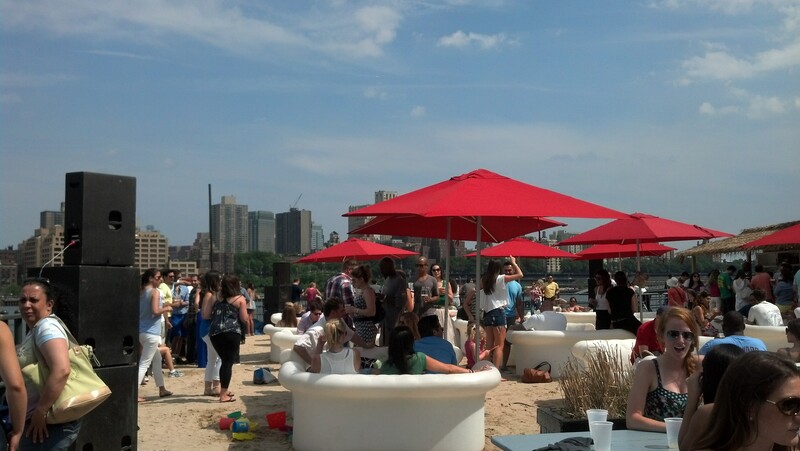 We did however discover the beekman beer garden beach club. Once you walk in there is a sand area with lounge chairs and couches. There was also another tent covered area with long benches and tables. I think the best part of this place was the views. 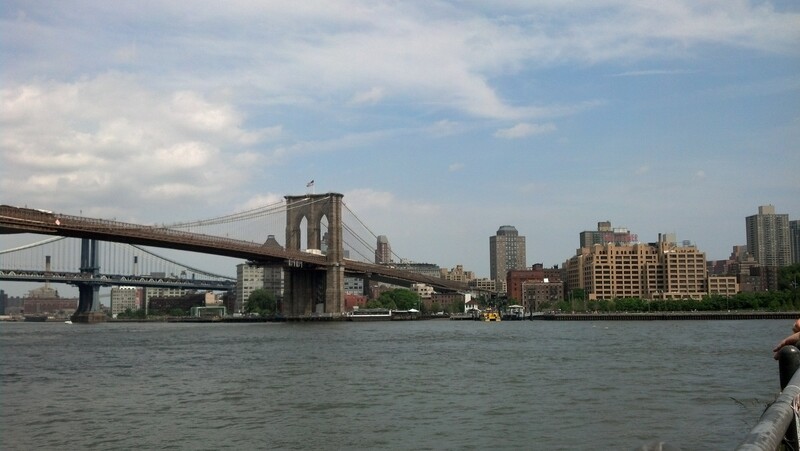 Just across the water was a view of Brooklyn and the Brooklyn bridge. 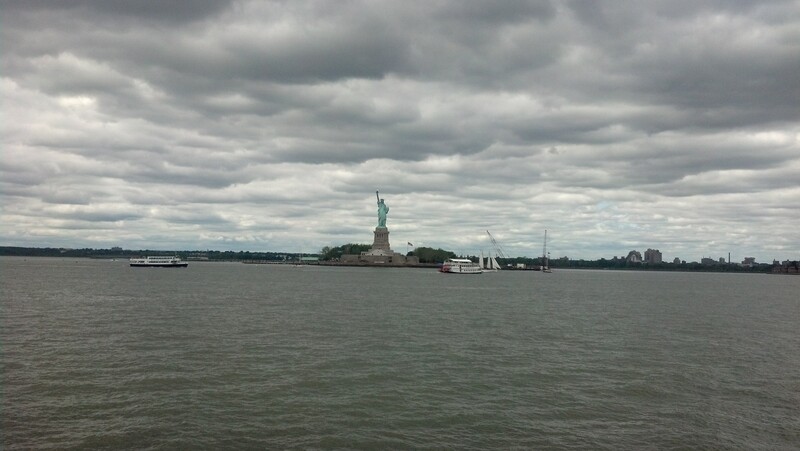 It was a great way to finish our getaway to NYC (and also pretty affordable). 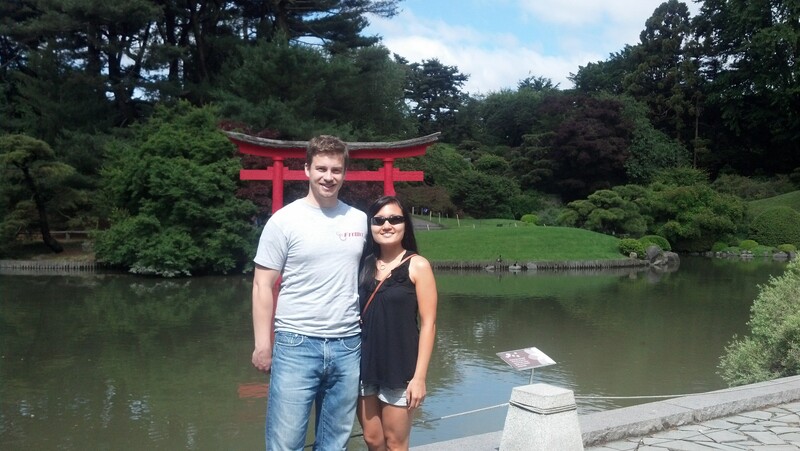 We had a blast seeing friends, exploring new sites, and trying new things. Can’t wait to come back! 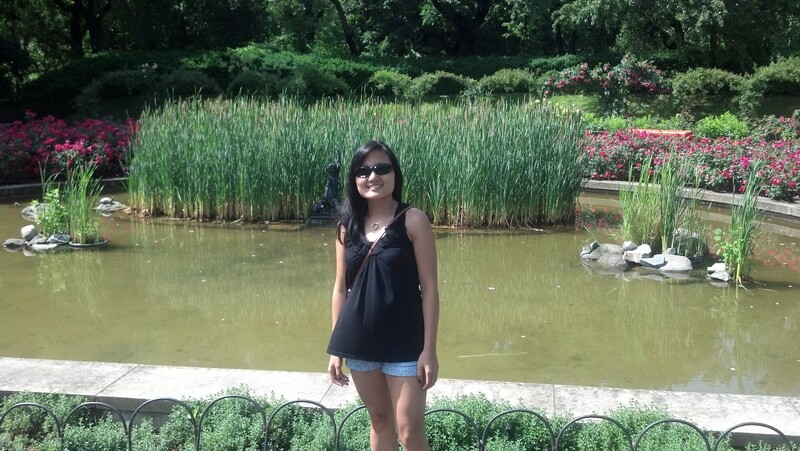 We also spent some time in Manhattan. 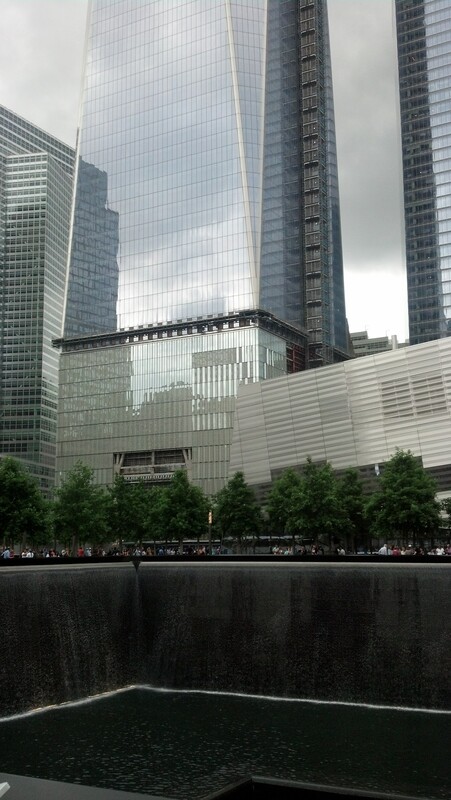 We, along with our friends, decided to visit the 9/11 memorial since it would be the first time for all of us. It is free to enter and you can get tickets there or beforehand online (there is a $2 processing fee but it goes towards the memorial). We registered for tickets online and I highly suggest that anyone visiting should do the same. You pick a time that you will be there and avoid waiting in most of the lines. Yes, there was still a wait, but nowhere near as long as the people getting tickets the day of. 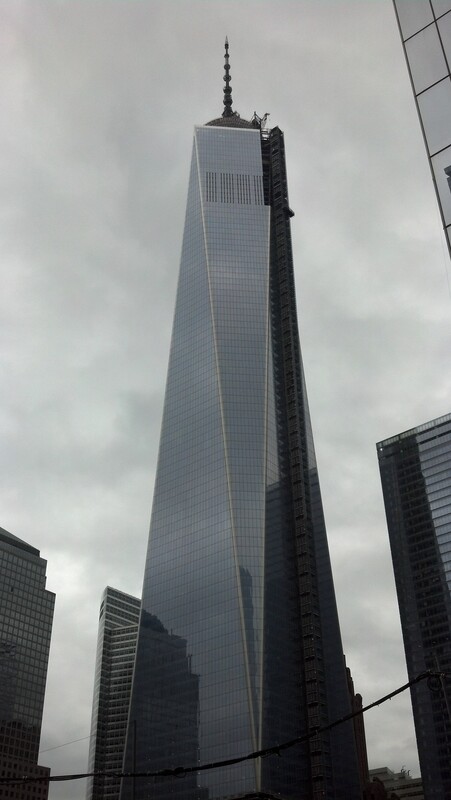 The memorial was built at the site of the twin towers. Once you enter, the sound of the water drowns out all of the noise of the city making it a peaceful place in the heart of the city. 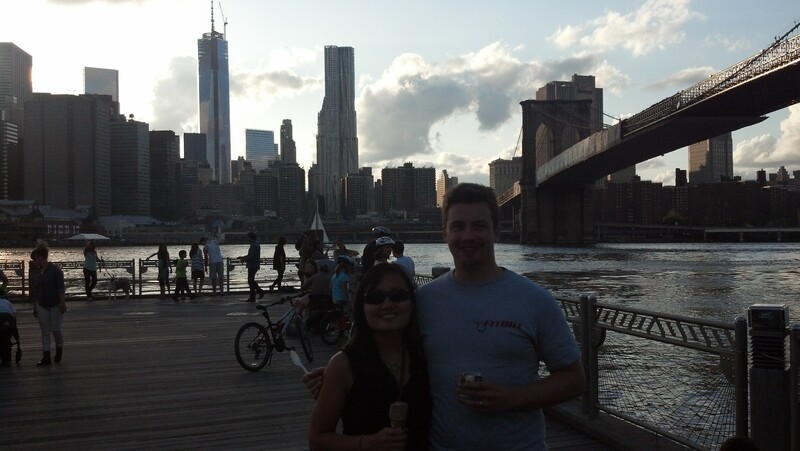 In the background is one world trade center, also called the “freedom tower” by some of the people we spoke to. 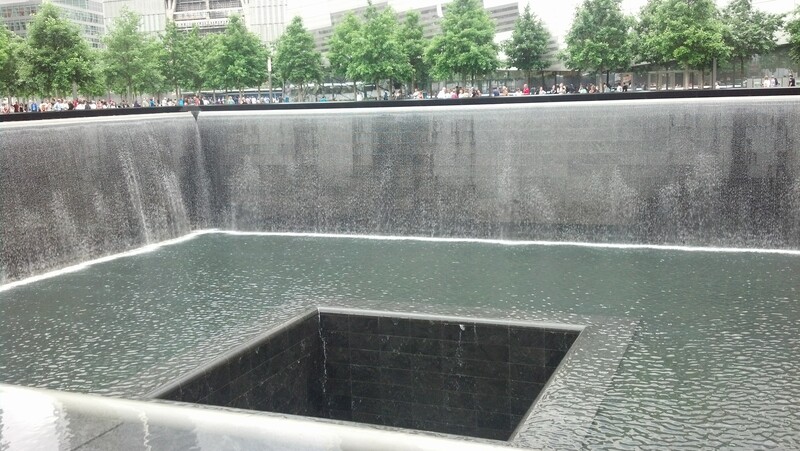 It’s hard to really see what the memorial is like so I recommend visiting in person. 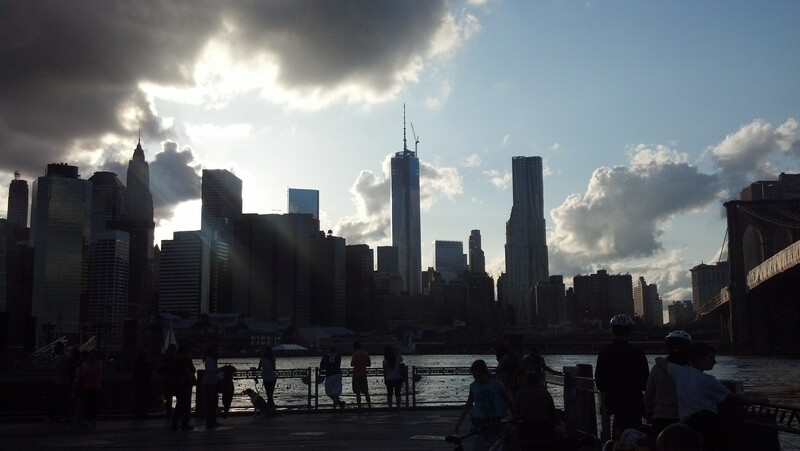 Since we were walking around lower Manhattan in the financial district, we walked around wall street and eventually boarded the Staten Island ferry. 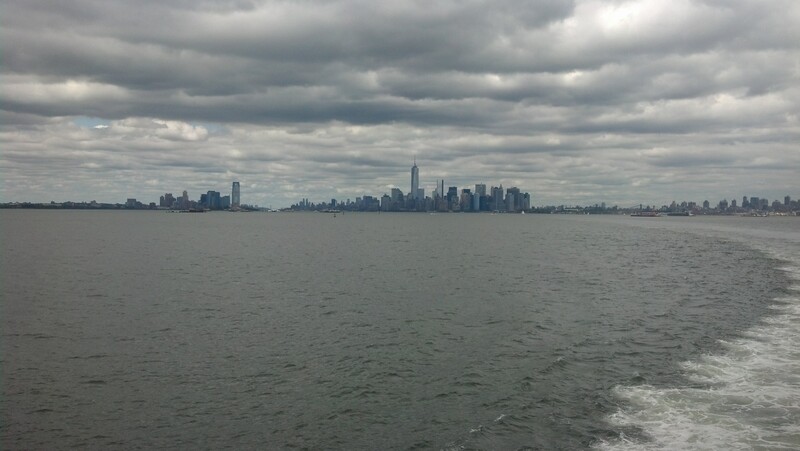 My friend mentioned that the ferry is free and you would be able to see nice views of the statue of liberty and the lower Manhattan skyline. 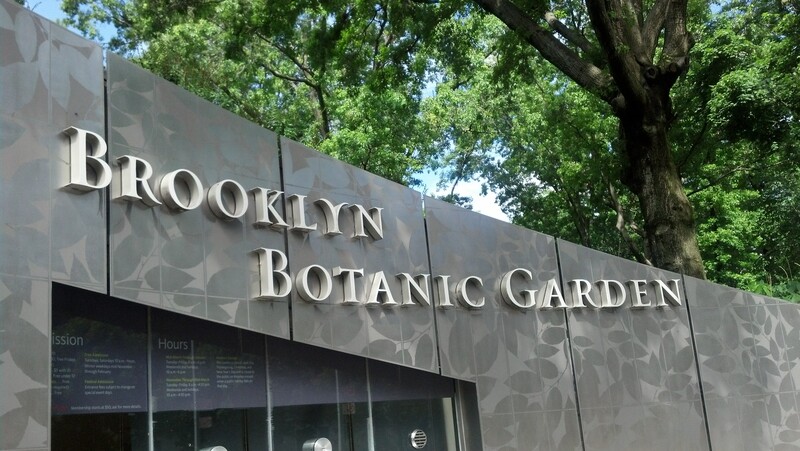 It was really neat and something to definitely take advantage of because it is free. Later that night, we decided to have drinks and play games at Fat Cat NYC. This place had a relatively affordable cover ($5), live music, and tons of games. By games I mean ping-pong, pool, chess/checkers, shuffleboard, and more! There were so many options. While it was a little crowded, it didn’t take long to get a ping-pong table and we ended up playing until 1-2am! Awesome time and a great way to wrap up a day in the city! After spending time in St Louis, we hit the road again for an unexpected long drive to Arkansas. 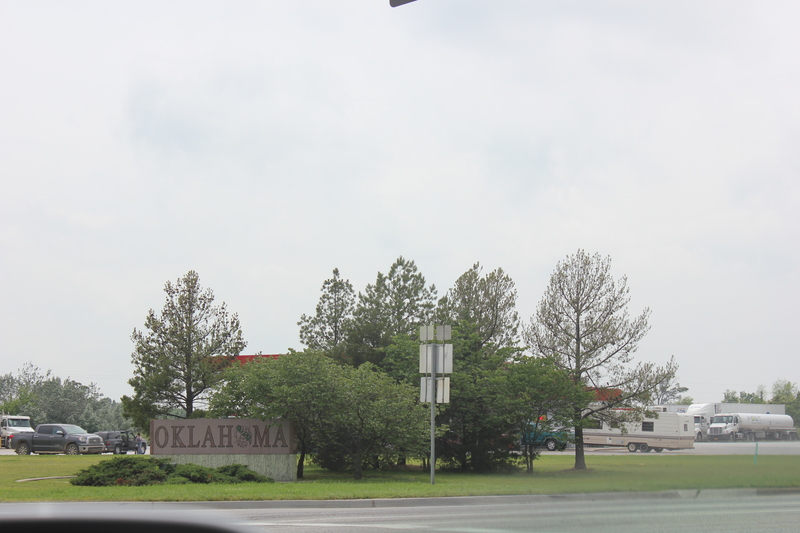 Since we were driving along the Oklahoma border, we decided it was worth it to add to our driving time and visit a new state (for me). 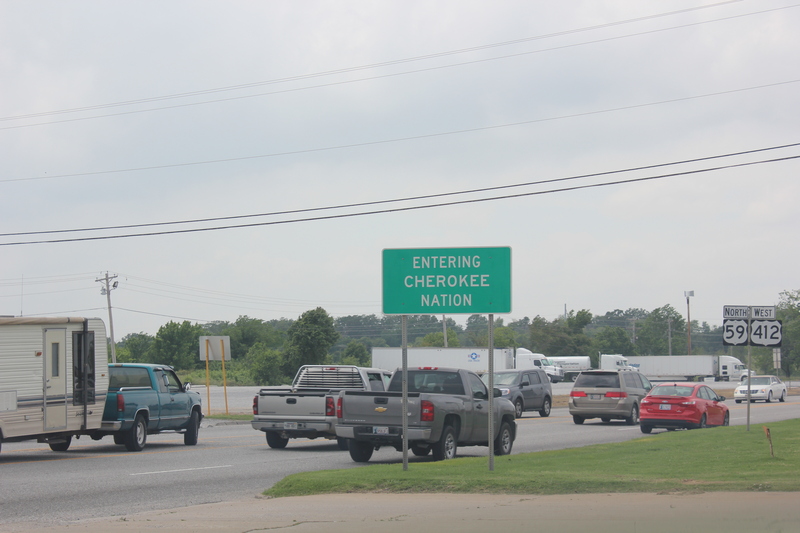 We entered into a small town and eventually ended up in Cherokee Nation. I can’t say that we did much exploring. It was a small town and we needed to keep driving if we were going to make it into Arkansas at a reasonable hour. After being in the car for several hours and rain starting, we became anxious to reach our destination. 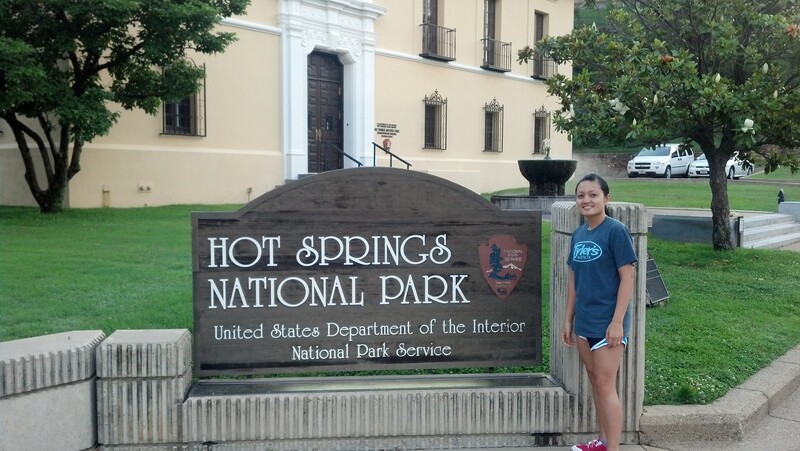 Finally, we made it to Hot Springs National Park just in time for dinner. We drove through the national park and ended up in the small historic area. I quickly started reading reviews for restaurants and found an Ecuadorian place that many people seemed to rave about. The rain finally subsided and it ended up being a lovely, cool night. 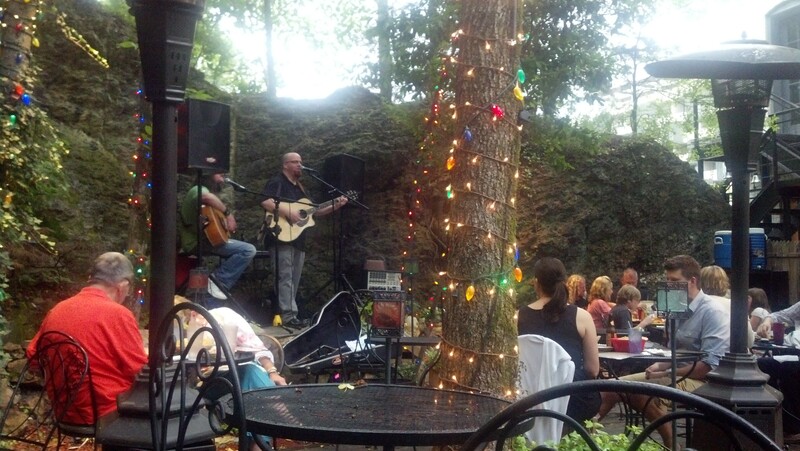 The food was delicious and there was even a live band playing. Very cool and unexpected given that the town is really small. We finished our meal and rested up for the next morning. Because I was excited to start the morning and see more of Hot Springs, Arkansas and since we lost some time the day before driving, we woke up before dawn and began our day. We decided to multi-task and put on our running shoes to see the area while squeezing in some exercise. I’m glad I brought my phone so I could take some pictures. There were old bath houses located all along the park where people would come to experience the springs. 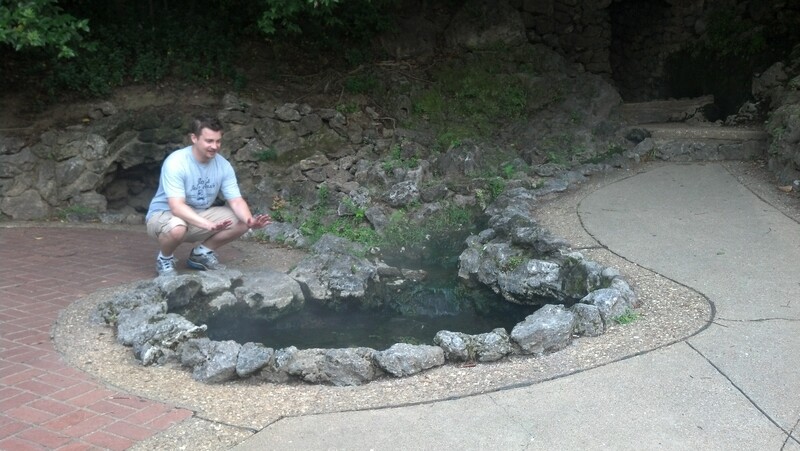 Maybe used the springs as therapeutic methods for physical ailments. The hot springs were really neat and it felt good to relax after a run feeling the steaming hot water. After checking out the springs, we found a little place to get breakfast before making our way back home. I feel like we accomplished a lot given our limited time and I was to visit new places in the country. While it went by really quick, I think this ended up being a fun getaway trip exploring new things! That is really the beauty of a road trip, being able to just drive anywhere you want at your own pace and discovering new places! At times it was tiring and it involved a lot of driving, but I hope we get to do another trip soon! After exploring Mammoth Cave National Park, we started our drive to St Louis the next morning. It was a pretty uneventful drive. I could tell we were getting closer to the city as we started to see more cars on the road. 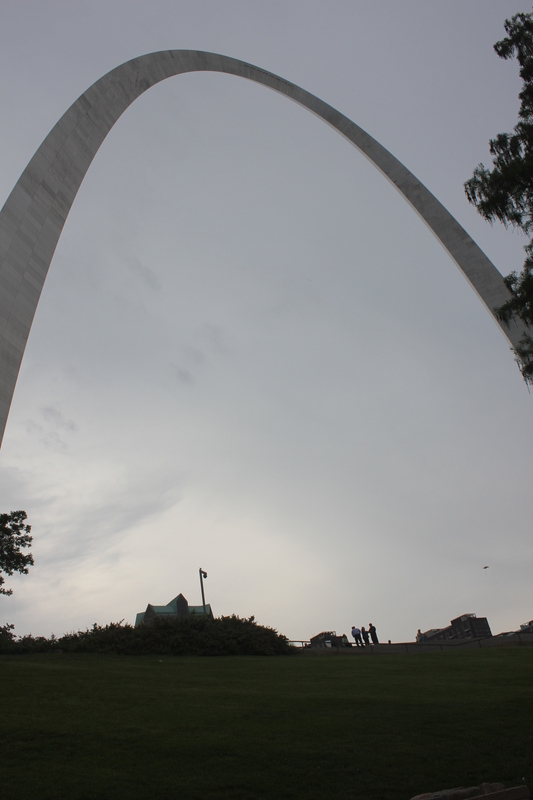 I began to see the arch at a distance and was excited to have finally arrived. Luckily it was a pretty cool out and the rain turned to a light drizzle. We parked the car and made our way to lunch, of course searching for St Louis BBQ. 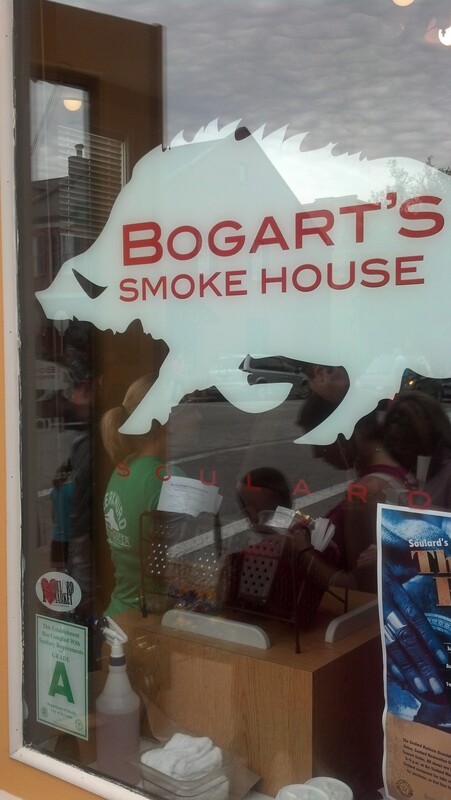 A friend of mine lives in St Louis and she recommended Bogarts. We arrived to a line out the door and down the block. The line moved fast and soon we were enjoying tasty BBQ. I had the pulled pork sandwich and Eric tried the ribs. While I wouldn’t consider BBQ my favorite food, it was pretty darn good! To relieve our full stomach’s we walked around a local farmers market checking out the produce and other goods being sold. 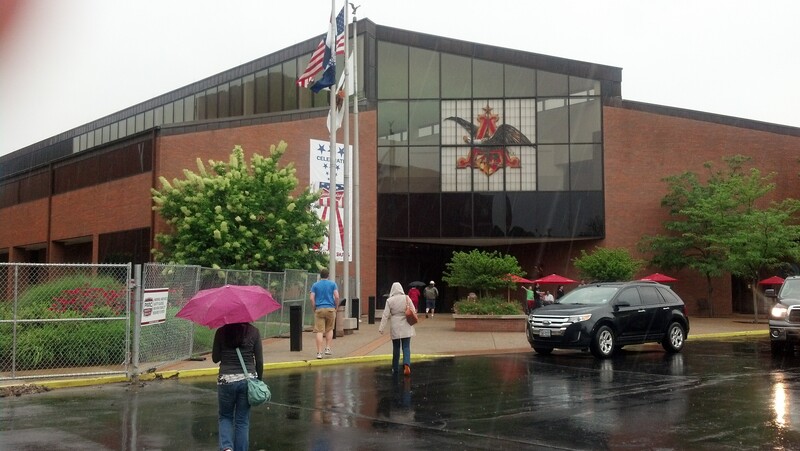 Soon it started to rain again, so we decided a nice indoor activity would be exploring the Anheuser-Busch brewery. Wow, it was huge! Bigger than the Guinness brewery in Dublin! 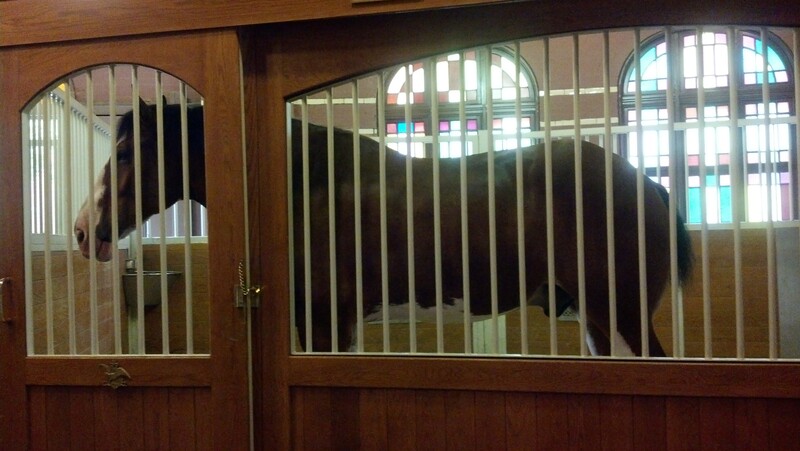 We started on the tour, saw the stables with a few Clydesdale horses, but eventually decided to wander on our own and go to the beer tasting room where you could try any of their beers. 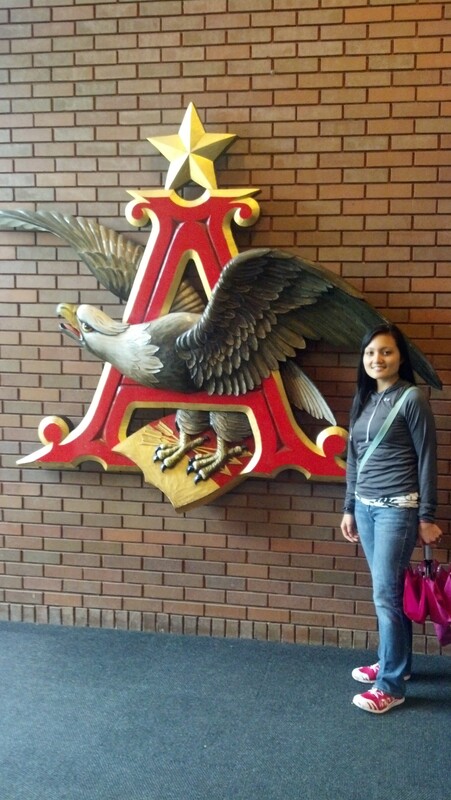 I never knew how many beers are actually part of Anheuser Busch! 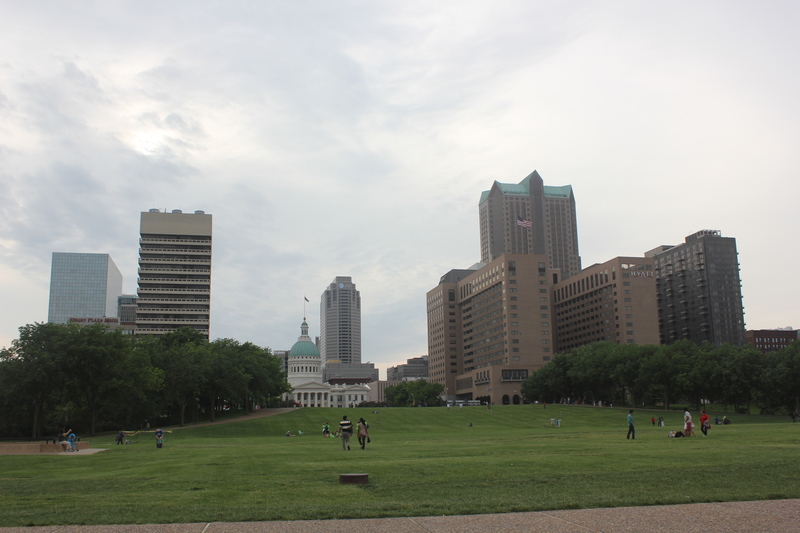 Finally the rain subsided so we took advantage of the dry weather to see the St Louis Arch before meeting my friend for dinner. We were able to park nearby and walked right up to it. 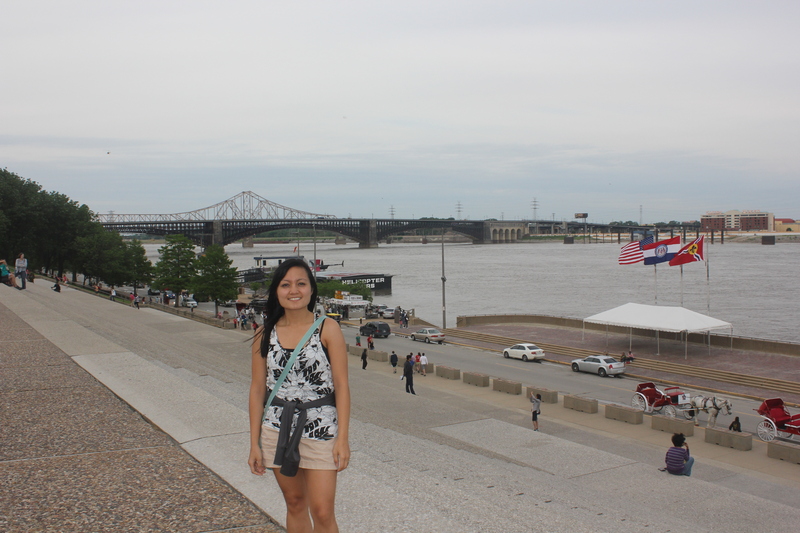 There were also nice views of the river and part of the St Louis skyline. It was not as crowded as I anticipated since it was a holiday weekend so we were able to enjoy it without pushing through crowds. Eventually we ended the day with dinner and beers at a local brewery in the city. I still can’t believe how much we accomplished in our short day visit. But, I was exhausted and fell asleep as soon as we got to the hotel. 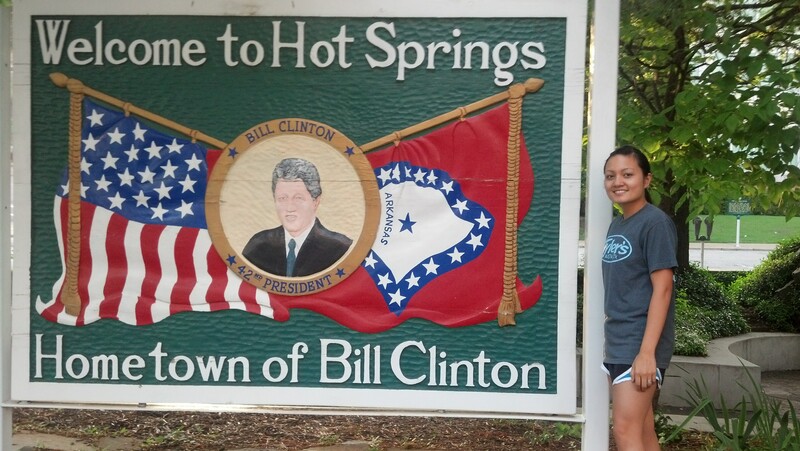 The next day to Hot Springs, Arkansas would be a long day of driving (not planned) so I was glad to get the extra rest! So back to where I left off. 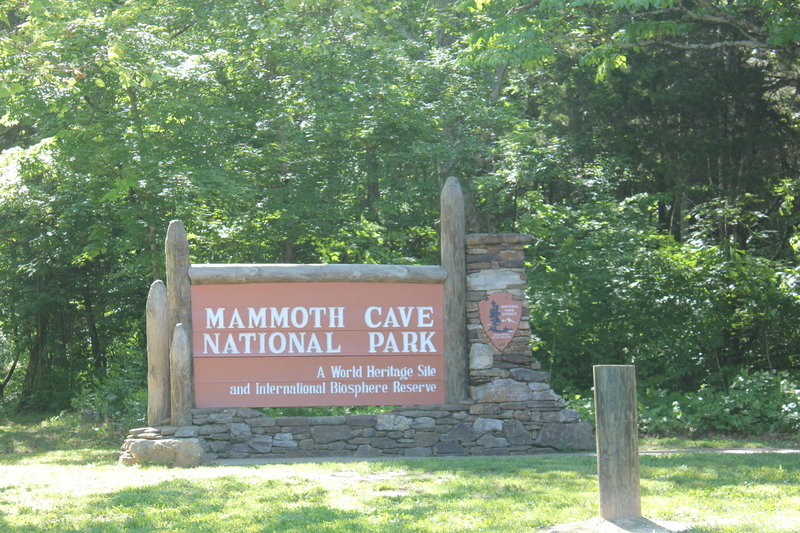 Our first stop on the road trip was to visit Mammoth Cave National Park in Kentucky. It is less than 5 hrs from Atlanta and the time change gave us an extra hour to spend there. We left late morning and arrived just in time to buy tickets to explore parts of the cave. 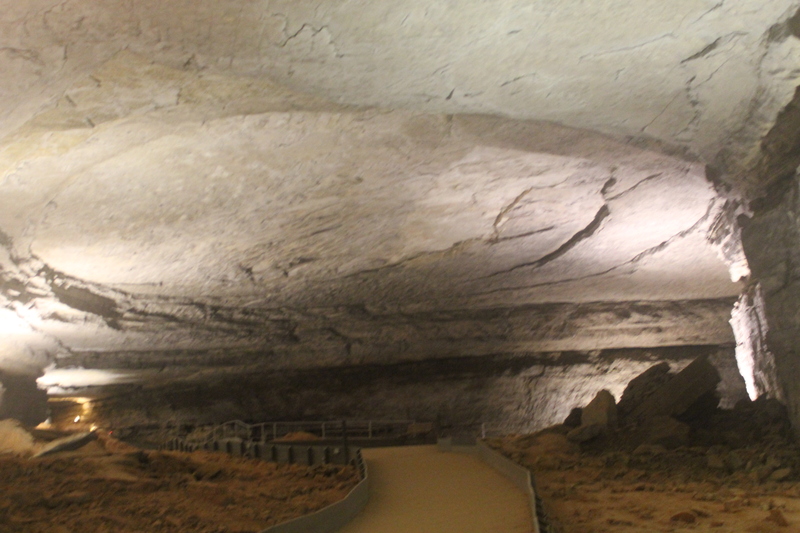 I can see how it is called Mammoth cave since it is HUGE! My favorite part was when the guide shut off all of the electricity inside and asked everyone to stay still and be quiet. It really illustrated just how dark it is inside the cave. I imagine the original people who discovered the cave walking around in pure darkness. Crazy! 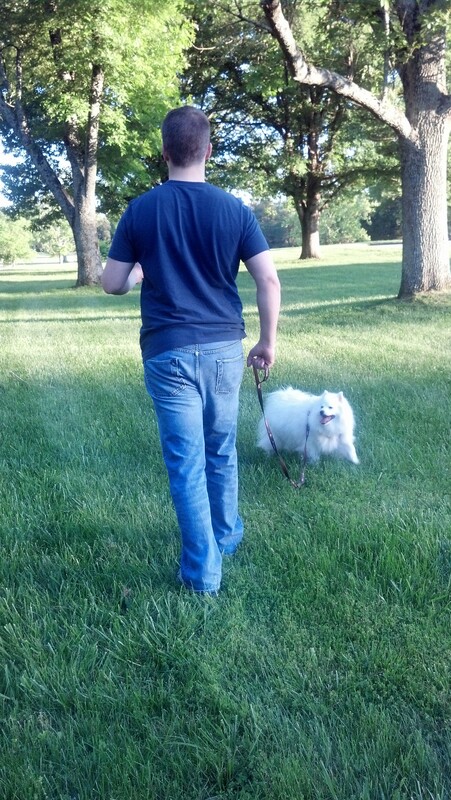 Afterwards, we decided to take Sura for a walk around the park. The national park is large and had several hiking trails. 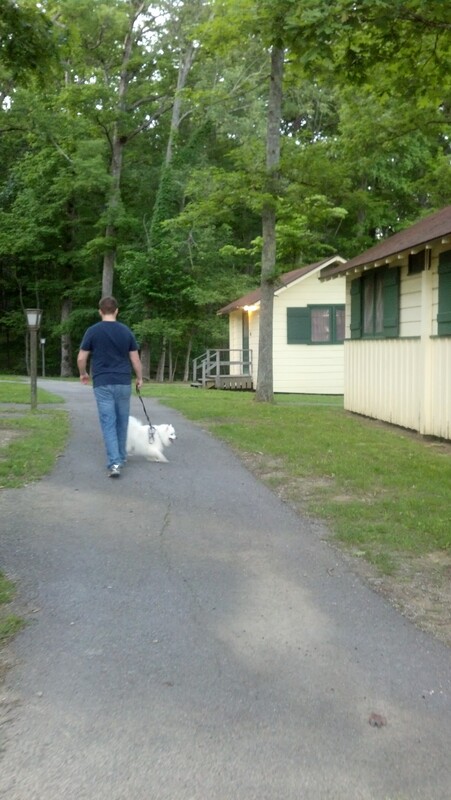 We rented out a primitive cabin in the park (it was dog friendly) and kept Sura there while we explored the cave. The cabin had the basics: bed, bathroom, lighting. I’m glad we went in May and didn’t really need heat or air conditioning. It ended up getting a little cold at night but otherwise it was enjoyable. As you can see in the picture below, it was not anything fancy. I think Sura was happy to explore a new area and enjoyed here early evening walk as the temperatures began to cool. 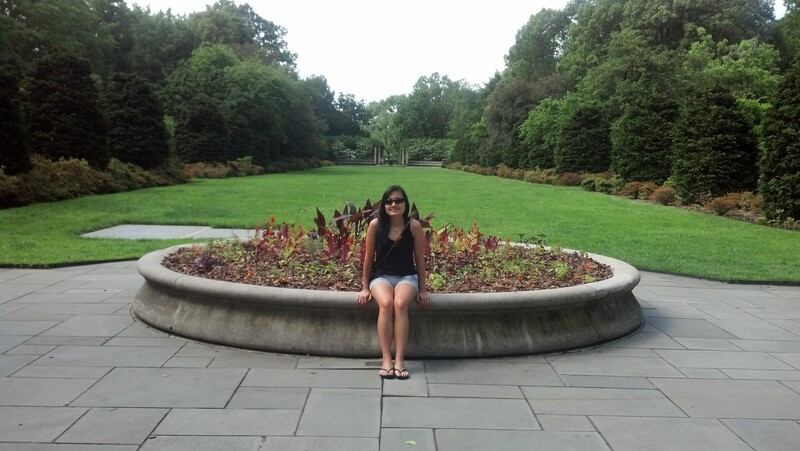 The park is beautiful and quiet. We saw wild turkeys, deer, and all sorts of birds. After the walk, I think we were tired from driving and went back to the cabin to rest up. It’s easy to just relax and sleep without any tv or radio…just the sounds of nature. We planned to wake up early in the morning to start our drive to St. Louis.